I visited Singapore with my family when I was 11 years old as a stopover on the way to Australia. The thing is, I remember nothing from that trip. I can barely remember last week. My brain is worryingly sponge-adjacent these days. So despite having actually been to the country, I’m still pretty clueless when it comes to the food from Singapore. The weather over here in Dubai these days is bang on. The kind of balmy evening temperature you’re lucky to get for one evening a year in England, but for opposite reasons. Here it’s usually too hot, but right now, sitting out on the streets is a pleasure. As the cars drive by, chatter from two supremely relaxed elderly Singaporean dudes drifts past you, along with their cigarette smoke. Nothing on the menu at Singapore Deli was familiar to me, and that made me very happy. To try a new cuisine is to ride a bike for the first time, or learning a new language; the excitement, the wonder, the mystery, the confusion, the fear of getting hurt! My brain couldn’t process such unfamiliarity. My stomach was confused. But pleasantly so. We started with Sambal Goreng Tempe. 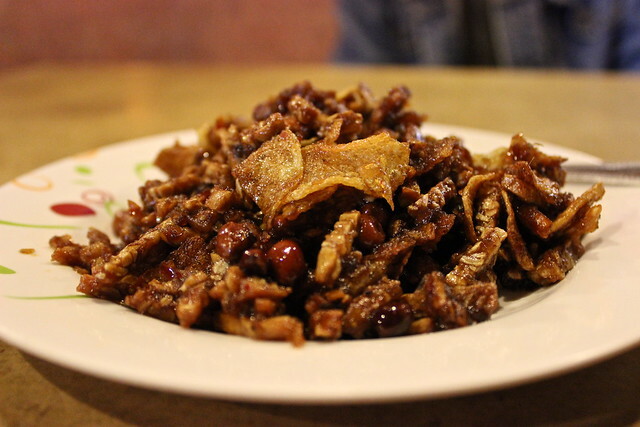 Fried soybean cake, potato chips and peanuts in a sweet sambal sauce – those words are music to my ears. This snack mix would have been perfect washed down with a cold beer. It reminded us a little of bhatmas sandheko, which we discovered in Nepal, but stickier, sweeter, smokier. So damn good!! The drinking foods of the world continue to fascinate me. 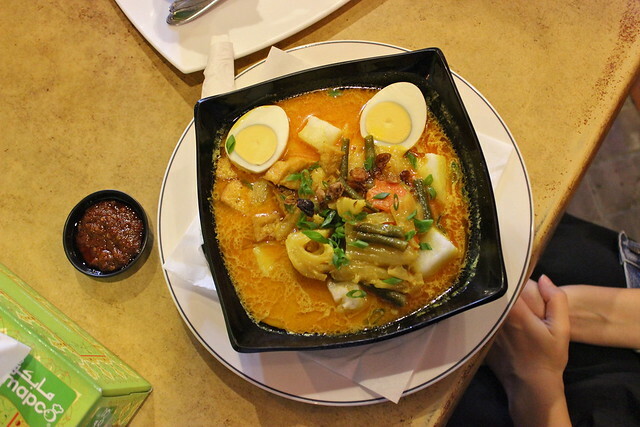 I had Lontong Sayur, a soupy dish of rice cakes, tofu, boiled egg and mixed vegetables in coconut milk. This is the kind of dish I could eat till the day I die. Creamy coconut milk, a little bit of spice, some egg for good measure, and a ton of mystery vegetables floating around as tasty surprises. I love it! Rice cakes aren’t going to get any Valentine’s Cards from me any time soon. As bland starchy fillers go, they are my least favourite. Give me some noodles. Give me a pile of fluffy rice. Give me anything but rice formed into moist, pointless cakes. 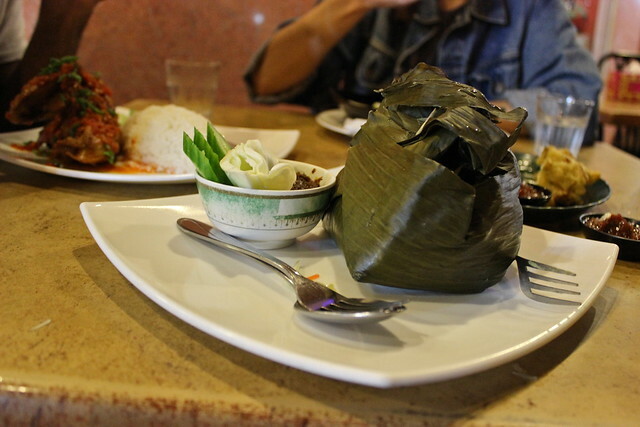 Nasi Peper was an intoxicating blend of rice, fried tofu, chicken, salted fish, bay leaf and lemongrass, wrapped in a banana leaf. The combination had a smokey, slightly bitter flavour that was completely foreign to me, but strangely comforting! The colours of this dish were so painstakingly bleak that we don’t dare share with you what the dish looked like inside this pretty banana leaf. Not all meals were designed to be instagrammed. This was just designed to taste good. 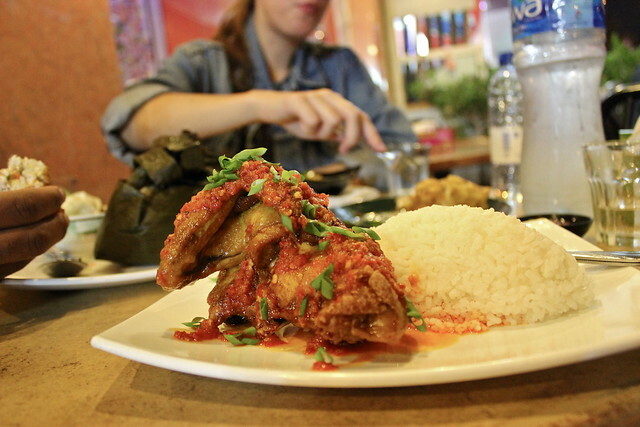 Ayam Rica-Rica, as well as being a brilliantly named dish, was fried chicken smothered with red chilli sambal. This was deliciously hot and got destroyed in a matter of seconds. Every culture has their own version of fried chicken, and each is beautiful in its own unique way. Singapore Deli’s has got that heat! 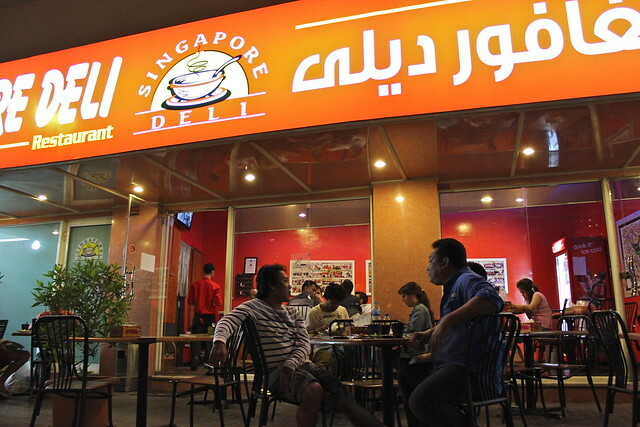 It’s inspiring to see a place like Singapore Deli exist in Dubai. These guys don’t water down their recipes for no one and don’t give a damn if your Western gut can’t understand their dishes. It’s great to find time and time again that there are joints in the older parts of town churning out authentic food that is true to their culture. I may not remember much of my trip to Singapore from my youth, but at least now I have an excuse to go back again and explore like the fiend I am.